Paint is what goes on the exterior of an object, and that is what will be seen by other people. Thus, it’s only obvious that it should be appealing. Make sure you get optimal painting results by using the best airless paint sprayer for a seamless outer coat. Our editor’s pick is the Titan ControlMax 1700. The company, Titan Tools, claims to be the leader in airless spray technology. As veterans of the industry, you can be sure that their products are top-notch. The Titan ControlMax boasts their High-Efficiency Airless technology which decreases overspray up to 55%. This means your paint will come out more controlled and will look more consistent. It comes with a 50-ft. hose. High-Efficiency Airless technology helps you get a more controlled, softer finish. It is capable of spraying unthinned paint. The cart can hold your paint can and is equipped with wheels for added portability. Prevents debris from getting into the sprayer with a paint filter. The cart has a hard time holding a 5 gallon can. Clean up takes longer than it usually would with other sprayers. Our runner-up is Krause & Becker’s Airless Paint Sprayer kit, with its ⅝ HP and a maximum psi of 3,000. Get better coverage out of this with its high-pressure sprayer. It’s mainly made out of stainless steel so no need to worry about rust and corrosion. It’s easy to clean, and the stainless steel exterior is one less worry about potential corrosion or rust. It’s lightweight and not bulky at all, making it easier to take around. Can be used with either a 1-gallon or 5-gallon paint can. If you’re going to use a 5-gallon can, you might need to use an extra platform so the tube can reach the bottom. Our budget pick, the HomeRight Power Flo 2800 C800879m Pro, is also a top contender despite its lower price point. It’s affordable, portable, and gets the job done. 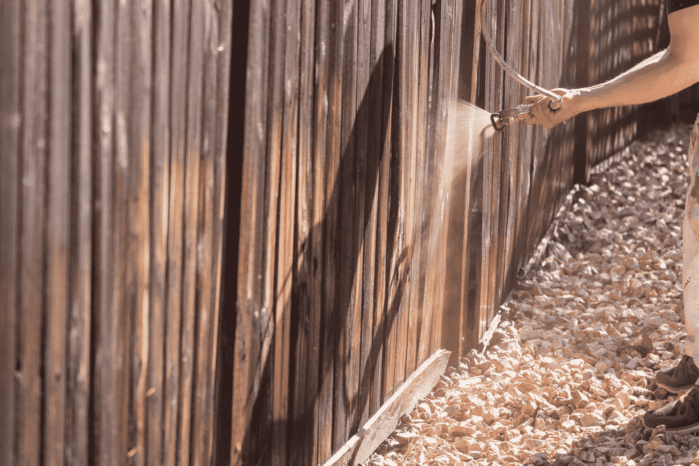 It’s recommended for large exterior projects such as painting your shed or fence. The paint sprayer comes with a 25-ft. hose for a more convenient, longer reach. It has a pressure of 2,800 psi which ensures that you’ll be able to tackle large areas with ease. It also has a reversible spray tip to take care of potential clogging. Cleaning is very easy; just run cleaning solution through the sprayer until there’s no more paint left. The pressure is easily adjustable via a pressure control knob to ensure a perfect paint job. It’s easy to assemble so you don’t end up wasting time to put it together. Reversible spray tip can remove clogs in your sprayer. The suction tube is short can’t easily reach the bottom of 5-gallon cans. The hose that comes with it is only 25 ft. long. If you have a big budget that’ll allow you to spend a bit more, consider getting this airless paint sprayer. The Graco Magnum 261815 ProX7 has a maximum hose length of 150 ft. and a maximum pressure of 3,000 psi. This sprayer has an ergonomic and compact cart design. The handle can be folded for an easier and more convenient storage. Clean up is also not a problem with this unit as you can connect the sprayer to a garden hose. It doesn’t take up too much space in storage. It’s also easy to take around because of its wheels. It can use a longer hose than most paint sprayers and operates at a higher pressure. Cleaning it up is convenient because of the power flush adapter. The hose is stiff so it is susceptible to cracking. It takes some practice to get used to so you might want to practice first before painting. This paint sprayer is a bit different from the rest as it is cordless. This is good for smaller painting projects, or for when you need a bit more precision. It boasts a perfect airless finish and ease-of-use. It also comes with batteries and a charger, and a cloth bag to carry all of the items conveniently. The sprayer has a container attached to the unit itself where you can pour in the paint. You can use unthinned paint with this paint sprayer! It’s small and perfect for paint spraying tinier objects. It already comes with the batteries and a charger. This sprayer can be used with unthinned paint, which saves you time. The paint container is small so you might need to refill it frequently. It’s slightly messier to use since the paint is closer to your hand than most paint sprayers. An airless paint sprayer makes painting easier, quicker, and cleaner. The sprayer gets the paint from the can through a tube and expels it at a high pressure. This gives a lot of coverage over a wide surface area quickly. Airless paint sprayers are better paint alternatives to manual painting tools like brushes or rollers. This is because they let you apply paint more evenly at a faster rate, and the texture ends up being smooth. 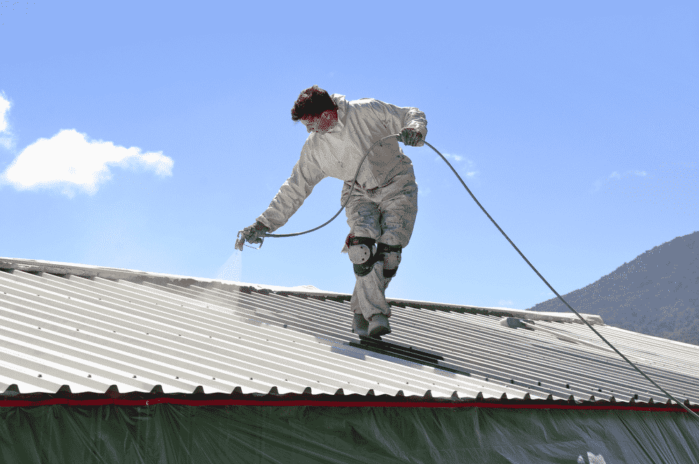 However, there is also a risk of overspray when it comes to airless paint sprayers. This is when a lot of your paint ends up on things you weren’t actually aiming for. It’s a bit wasteful and messy. The features you need to look out for are hose length, tip size, paint type, maximum pressure, and portability. Most sprayers come with a cart, some are less bulky and have a top handle for you to carry around. 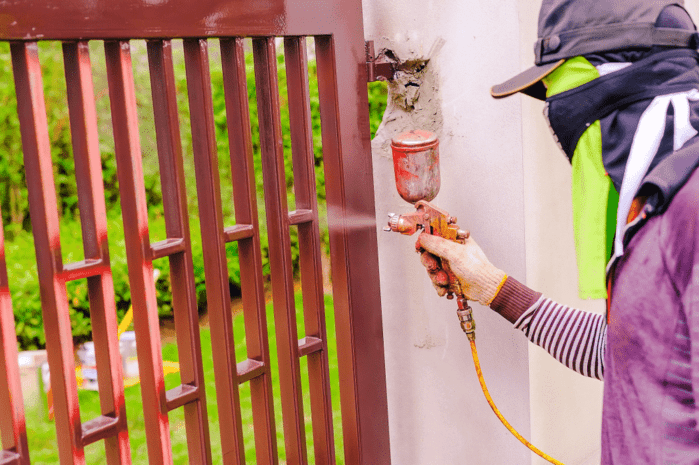 Normally, those who use airless paint sprayers want to use it because it can cover large areas quickly, like house exteriors or walls. Now, you would typically want one that’s easy to move around, plus a long hose to reach as far as you can. Paint sprayers normally come with hoses but the maximum hose length they can handle is usually double that length. If you find that you need a longer hose for your sprayer, you can buy one separately. Tip size is also important as the needed size varies according to the job you need to do. Some tips can be used for thicker paint, too. Tips can wear out so you’ll have to replace them later on. Some sprayers have reversible tips to remove clogs from the sprayer easily. Usually, the paint you must use is thinned paint, however, a lot of sprayers can now accommodate unthinned paint too. This saves you time and money spent to thin your paint before using. Pressure is also related to the kind of paint that you use. The pressure depends on what kind of paint you’re using, and usually, this is adjustable. 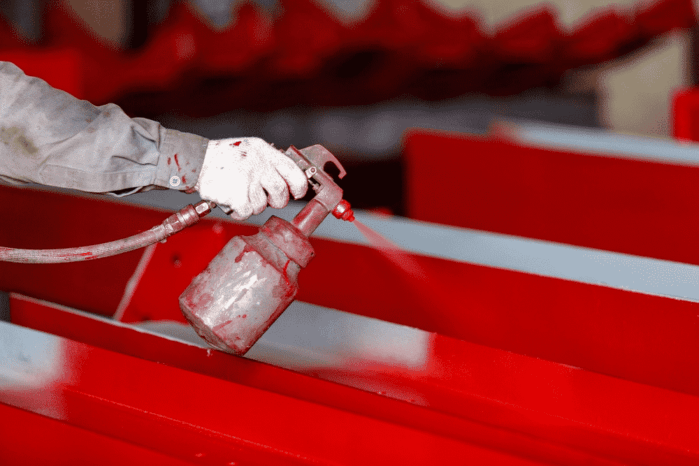 Higher pressure doesn’t necessarily mean better for some types of paint. Too little pressure can result in the uneven paint; this can result to gaps in the paint application. Too much pressure, on the other hand, can result in overspray and can cause unnecessary strain on your sprayer. Wear protective clothing. It should go without saying that you must wear clothes that you don’t mind getting stained. However, with paint sprayers, you need an extra level of protection. Wear goggles and gloves to protect your eyes and hands from any overspray. Wear long-sleeved shirts and pants to cover your skin. If you’re painting a specific object rather than a wall or a fence, make sure you have a designated painting spot. You wouldn’t want to get paint on things that shouldn’t be painted on! Practice before painting the real thing. This is important especially if it’s your first time handling an airless paint sprayer. Do not hold the sprayer too close or too far as it might create unevenness. The recommended distance is around a foot away from the surface. Clean your paint sprayer after using them. If you leave them uncleaned after your paint job, the paint might dry up and cause damage to your paint sprayer. Using a paint sprayer need not be a Herculean task. If you don’t get it right the first time, that’s fine. It just takes a while to get used to. Once you’ve gotten the hang of it, you’ll be painting everything in sight in no time! It’s obvious that an airless spray painter will make your life easier when it comes to painting. Sometimes it can feel like a chore but with an airless spray painter, it’ll be a breeze. It’s definitely an upgrade from manual painting with brushes or rollers. However, they’re also a bit pricier so be prepared to shell out some money. It’s the price you pay for convenience, after all. However, it’ll also save you money in the long run because you’ll be doing it by yourself instead of paying a professional. The Titan ControlMax 1700 Pro is a decently-priced airless paint sprayer that’s also guaranteed to be of high quality. The High-Efficiency Airless technology claims to reduce the overspray by up to 55%, meaning you’re wasting much less paint. The sprayer can also handle unthinned paint so you’re not going to waste time thinning your paint before using it. Furthermore, it’s also covered by warranty so there’s no need to worry about accidentally wasting money on a broken product. Of course, it’s important to be sure of what kind of paint sprayer you’ll use. There are other sprayers optimized for different tasks so you should check them out as well before deciding. Remember that the exterior paint job can make or break an object’s appearance especially when you’re working on larger surface areas. That’s why the best airless paint sprayer is a product worth investing in.